In this post Twitter enthusiast Garin Kilpatrick shares his tips on effective ways to get more followers. It is hard to put a price on a Twitter follower but the host of The Price is Right, Drew Carey, is offering to donate $1 to cancer research for every new follower he receives this year. The following eight tips will enable you to make the most out of your tweets and help you connect with as many followers as possible. Tweet your best stuff out during peak times, and you will maximize your retweet potential. The perfect time for retweets is right after lunch. Between 1 p.m. and 4 p.m. is when I usually get the most retweets. 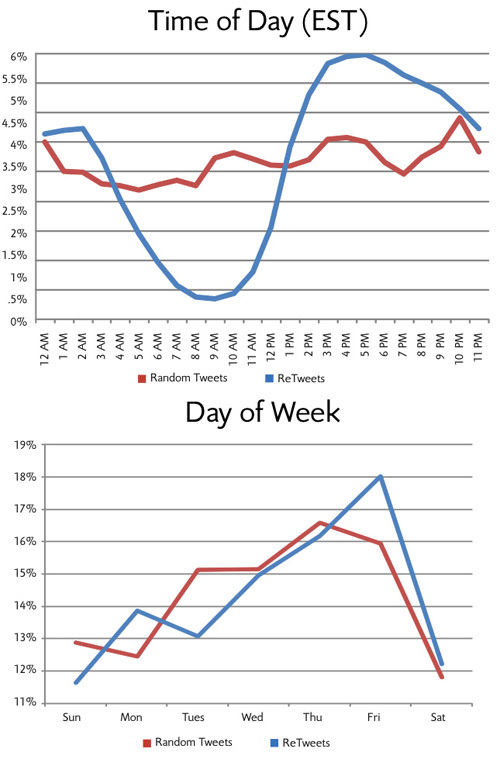 Fast Company recently published a post called Nine Scientifically Proven Ways to Get Retweeted which is where the retweet graphs below are from. You need to consider, of course, the time zone your followers are in. The better you can make yourself aware of the timezone your followers are in, the better you can target your best tweets for maximum exposure. Twitterholic allows you to quickly find the most followed people on Twitter. The top 1000 most followed people on Twitter are listed and you can see which people are reciprocators. A reciprocator is someone who will probably follow you back because they have about as many followers as they have people following them. Twitter Counter is another website that counts and ranks people on Twitter and they also offer widgets that will display the current number of people who follow you. Social Oomph offers several tools that allow you to tweet more efficiently. These free services range from scheduled tweeting (the site used to be called TweetLater.com), to the ability to automatically unfollow anyone who unfollows you, and the ability to automatically follow anyone who follows you. Saving time here will give you more time to spend finding cool people and building meaningful connections. The more links you have, the greater your potential to find new followers. Even a few simple links on other social profiles you already have will convert to several new Twitter connections over time. Facebook offers a “contact info” field specifically for links in the information section where you can put a link to your Twitter account, blog, and other sites on the web you might have. An app I use for Facebook is Web Profiles and I also developed a custom Facebook twitter badge including a button that links to my Twitter account. My most-commented-on Facebook wall post was when I simply asked who is on Twitter and what their username is. Open up another Twitter account if it is relevant to do so. Working as a community manager for Eduify I have been able to build followers much faster by using two complementary accounts, @eduify, and @eduifyQuotes, as well as a third support node for discussion and replies, @askeduify. By having @askeduify I can reply to everyone who sends a message to @eduify without polluting that stream with replies that are only relevant to a few people. This strategy of separating content from conversation has worked for me and recently @GuyKawasaki (and @guysreplies) adopted this strategy as well. Having two accounts also doubles your daily follow limit so that you can push your growth even harder, if you want to do that. Reward the people who retweet you the most by suggesting others follow them on Friday. Retweets are one of the best ways to find new followers and FollowFriday is my best method of building retweeting relationships. If you take the advice from these eight tips there is no doubt in my mind that they will help you grow your following on Twitter, and you do not have to stop here. There are plenty of Twitter tips and apps that will help you learn about Twitter and how to tweet more effectively. A great place to start is the free Mashable Twitter Guide Book. Another cool site is TwiTip.com, which was started by Darren Rowse of Problogger fame. Good suggestions! I’m a big fan of SocialOomph for spreading out tweets via scheduling. I’d add to your list the Bit.ly Sidebar bookmarklet – it streamlines formatting tweets and connecting the links to your Bit.ly account. Thank you for this, its great information, especially for someone like me who is new to twitter. Any tips for the list feature? I would agree with some of the tips. Twitter needs to be as personable as possible. I don’t like to automate anything. Genuine, unique, hand-typed tweets work for me. I also like to mix communication in with content. Make it a personal experience and save the multiple accounts; we have more than enough of them on twitter anyway. It’s a form of spam in my opinion. 1 person = 1 account.